Following from Clay's Infant Environment Part 1 here is Part 2 showing Clay and his infant mobiles. The above photograph is of Clay and his mum Tasha making the Octahedron. I think I can see some double sided tape there. I purchased all of our mobiles although Tasha and Charlene show that you can make them yourself. I don't know of any one source of information for the mobiles. If you know of anyone who has completed Montessori infancy training they may be able to help. Most of the mobiles can be purchased through Etsy. 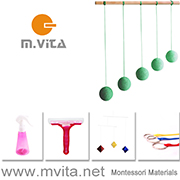 At Home with Montessori also has a brief description of some of the mobiles and are based in Australia. It's wonderful to see little Clay focusing on the mobiles. I was truly amazed when I presented the mobiles to Otis and I would highly recommend them. Like most things Montessori, it may require a little time and research but well worth it in the end. Remember Clay from last week. He is almost two now but I really wanted to give you some insight into his infant environment. One of his mums Charlene is trained in Montessori (3-6 years) so she had a pretty good idea what she was doing. What you can see in these photographs is that Charlene experimented a little with the floor bed. She said that she tried three different beds and found this aspect quite tricky. He actually had a little basket/bassinette for the first 6 weeks, then moved onto a cot sized mattress but I found him falling off this a lot. So I then made a square shaped mattress using a thick piece of foam. This worked well as far as him not rolling off it and in the summer but I think when it got colder it was too close to the floor. So I switched up to our final one, a king size single when he was 10 months. I think with our next baby I will just use a king single straight up. And perhaps put the foam on the ground when he/she is rolling a lot, to lessen and soften the fall! Ah sleeping and babies, it's probably the biggest issue for every parent of a new baby, we Montessorians just like to add challenges! But the benefits for the babies are amazing. I can totally see in Clay his sense of spatial awareness, sense of direction and the caution with which he moves about in his world are all down to having slept on a floor bed. And that's just what I can observe. The full extent of the benefits on his whole development probably pass unknown to me! Clay also loved his mobiles and his movement mat. I especially loved it (and he too) when he discovered he could touch himself in the mirror! Once again, thank you so much Charlene for sharing with us. What I love most about these photographs is looking closely at detail, the beautiful pictures on the wall and the wonderful items on the shelves. So, so sweet. Tomorrow I will post some photographs of Clay and his infant mobiles. I remember seeing a photograph of Maria Montessori sitting next to child weaving. It was from this photograph rather than her texts that gave me the idea to try it with Caspar. As I would prefer to make something useful I decided to give circular weaving a try. I thought they would make wonderful mats/coasters/doilies. I purchased a circular weaving frame but as soon as I put it together I knew it would be too difficult for Caspar. I think I will need to put it away for a good couple of years. Instead I decided to make a weaving frame that he could use. I cut a circle out of strong cardboard, measured and cut a few slits. You may be able to see I wasn't very accurate in my measuring but it didn't make much difference. I wrapped the white wool around the circle through the slits and taped the ends on the back. Then I started weaving with wonderful rainbow wool. Starting the weave is a little difficult so I started it for Caspar and also gave a basic demonstration. We used an extra large tapestry needle. I taped the wool to the needle so he didn't lose the end. He went back and forwards and skipped a few weaves but as long as you pull it tight it turns out ok. He couldn't work at it for long perhaps 5 minutes at time. He would go back to it after an hour or so. To finish it I cut the white wool off the frame and tied the ends together. It is a little fragile but I think as he gets older and makes it tighter with more weaves it will be stronger. So that we could see the results quicker, he made two small doilies only going up half the frame each time. Rather nice don't you think? Remember Clay from the DIY Learning Tower? Today his mum Charlene joins us and allows us to take a peek into their lives and how they are influenced by Montessori. Charlene was the inspiration for this series and I cannot thank her enough for her contribution. My name is Charlene and I live in the Hunter Valley with my partner of 10 years, Natasha (she’s a paramedic) and our son Clayton who is 22 months old. I first became interested in Montessori when I was living in England and Nanning for a family with two daughters, one of which had been to a Montessori Children’s House. I had always had an interest in education but did not want to be a traditional teacher! I then trained in London at the AMI training institute to become a 3-6 Directress. I worked in London for 3 years. Two years working at MMI (Maria Montessori Institute) run schools. The experience I gained there was invaluable. I feel very blessed to have had that experience, working with some truly inspirational people. It has changed how I live my life. Who I am as an individual and most definitely the mother I am. I moved home to Australia in 2007 and began my journey into motherhood. This is a mammoth question. Starting with the key to Montessori, I try to “follow the child”. I observe him. I try to learn as much as I can about his development so I can see where he is at so I can better meet his needs and follow his interests. I prepare the environment to meet his needs and follow his interests. I act as a link between him and the environment. I try to sit on my hands and NOT interfere with his efforts. I actively encourage his growing independence and try very very hard not to do for him, what he can already do for himself! I act as a role model to him. I try to limit praise and punishment but instead offer examples, work in collaboration and use positive reinforcement and choice. I try to be consistent, to offer routine, order and boundaries, to aid his sense of security and trust. I look at myself and try to reflect and realize that I am human and not perfect. I am a mother, we are a family and this is his home. It doesn’t work like that 100% of the time. No matter how little or how great I apply myself and these Montessori principles I can see the benefits in him everyday. Who he is becoming is re-affirming all that I have learnt about Montessori. 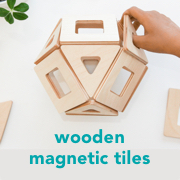 Do you have any tips for parents creating Montessori inspired spaces at home? Be kind to yourself. It is not about being the perfect mother. Trial and error. Just try something and then observe how your child responds. I used so many different floor beds and I also do this a lot when setting up a new shelf i.e. his kitchen shelf. At first there was too much out there for him and I had to tweak things! As Cathy (Finlay’s family) said, I think the easiest and one of the most important things to do to aid your child’s development would be to provide a TV free environment for the first 5 years of life. Just take it out of the lounge room, give it away or put it in your room! I have not really been a big blogger but now follow “How We Montessori” and am getting into all the blogs I discover through Kylie. My son, my wife, Maria Montessori and other Montessorians. Thank you for sharing with us Charlene. Next week I will post an article on Clay's infant environment providing some ideas and inspiration for anyone setting up a nursery or planning to in the future. Finlay's family needs little introduction. His mum, Cathy blogs at the very popular A Montessori Home. When I found out Cathy was a trained Montessori teacher (3-6) I spent hours going over every post. It is such pleasure to have Cathy over to answer some of my questions. Our happy little family consists of myself, my partner Brent, and our 16-month-old son, Finlay. I'm originally from Melbourne, Brent is from Perth, and Fin was born in Auckland, NZ, where we are living right now. This year I started a home-based childcare business and have created a Montessori toddler environment at home. Children have demonstrated that their joy is found in the continuous work necessary to achieve self-perfection. This is also true of the adult. There must be some special task, some special way of moving towards perfection, and in this alone will happiness be found. The most important thing for me as a Montessori teacher was to make sure that Brent and I were on the same page and that he understood why I was so, hmmmmm.... obsessive?!... about setting up our home when we were expecting Finlay. Happily, Brent has always been very interested in the philosophy and has embraced every aspect of Montessori parenting along the way. I think our experience would have been very different if we hadn't been united in this decision. Our entire home has been set up with Montessori principles in mind (well, except our office, which leaves much to be desired...!). Fin has always slept in a floor-bed (along with co-sleeping in our bed), we have low shelves in each room with Montessori materials (these are constantly changing to meet the developmental needs of Finlay and the other children in my care), low tables and chairs for meals, real cutlery and crockery, books, music, art materials, all available at all times. Recently we have added a food-preparation table and a dish-washing table (inspired by your wash-stand, Kylie!) so that Finlay can take part in these aspects of daily life. More than anything physical, I think the most important way we have implemented Montessori at home is in our attitude toward Finlay and the deep respect we have for his development. We are always conscious not to interrupt moments of concentration, we include him in our daily tasks and allow him to try new things as soon as he shows an interest (even if this is inconvenient for us at times!). We surround him with rich vocabulary, beautiful music, art and nature. I think these things are much more important than having all the right materials on the shelves. I think the most important things to consider are beauty, nature, order, function, accessibility and respect. When considering any object, clothing, toy or piece of furniture for your home, ask yourself: "Is it beautiful? Is it made from natural materials? Is it functional? Will it support my child's developing independence? Does it show my child that I respect him/her? Will it allow for freedom of movement? Will it invite purposeful activity?". All too often we are bombarded by advertisements telling us we 'need' to buy ridiculous things for our children so they will be happier/smarter/safer - stay true to your beliefs and try not to be sucked in by it all! If you do nothing else, in my humble opinion, the most important thing you can do is get rid of your television (or at least keep it out of sight and only watch it when children are sleeping). By Maria Montessori - 'The Absorbent Mind', 'Education and Peace', 'Creative Development in the Child'. By others - 'Montessori from the Start' (Lillard & Jessen), 'Oneness and Separateness' (Louise J. Kaplan), 'What's Going On in There?' (Lise Eliot), 'Understanding the Human Being' (Dr. Montanaro). Blogs: Sew Liberated is a favorite, as well as Meg's former blog, Montessori By Hand. At Home with Montessori, Montessori ici, Montessori in Motion, Wide Open on the Mommybahn, The New Mommy Files and of course 'How We Montessori', are my favorites! All of the books and blogs above are a constant source of inspiration. I have a new love affair with Pinterest! It's a wonderful way to get visual inspiration from others and create your own inspiration boards. Most of all, Finlay is constantly inspiring me to re-create our home to keep up with his development. I can see so many attributes in him that I am certain have been nurtured by our Montessori environment - what more inspiration could I need? Thank you so much Cathy for sharing with us. Just in case you missed it, Cathy's blog A Montessori Home is a must read. I don't intend on showing you all the activities we do because so many others do it better. The internet has so many blogs dedicated to showcasing activity ideas. This one I thought was worth showing as it is a really good example of an activity to do at home and nothing goes to waste, the herbs can be used in the kitchen later. The cards are designed as three part cards to be used by a much older child, as the instructions say one that has completed a lot of botany work. Ignoring the instructions today we use them for this simple matching activity. Caspar is familiar with some herbs in our garden, by drying herbs and using them in the kitchen. For him this activity gives him the opportunity to look closer and compare. As the herbs are fresh and perishable I needed to encourage Caspar to do the activity today. So eventually I set it up on a table and sure enough he came over to do the activity straight away. He found the work much easier than I expected but like a lot of things he wanted to repeat it over and over again. Later we did this again on the kitchen bench and I am sure many of these will somehow make it into dinner tonight. I really want my children to be familiar with herbs, I didn't know what basil was until I was like 19! Did you know that some people call coriander - cilantro? Winter school holidays are without doubt more difficult than the summer holidays. It has been cold and wet so we've had to come up with some extra indoor activities. Also the two boys and I have been terribly ill with a virus that we don't want to pass onto anyone else ruling out any play dates. Today we made our own beeswax candles. The beeswax smells so delicious. We have done this many times before but recently I found this coloured wax making this time extra fun. In my opinion beeswax candles are the best candles to use around children. The smell is totally natural. Because of this natural smell they are perfect to use at meal time too. Of course when burning be careful in handling/placement/supervision around children. I don't know if it is all children or just Caspar but he really loves rolling things, making this an activity that he really enjoys. Also what nice gifts these candles would make. Quality wicks are essential and the wax needs to be wound tightly. I start Caspar's candles for him and will need to seal the ends and in some cases cut the bases so they sit flat. These colours are just delightful. I enjoy activities like this as the results are fast and the end product useful. I think we will be making more tomorrow.